Welcoming tribes to conquering settlers. Genocide is the systematic destruction of peoples based on ethnicity, religion, nationality, or race. It is the culmination of human rights violations. There are numerous examples of genocide throughout history, some being more infamous than others. For example, Hitler and the Jewish Holocaust is probably the most well-known case of genocide in modern history. There are other cases that are not as well known, especially in our American culture where, historically, we tend to focus on the atrocities of others and ignore our own. One such case is Native American genocide by European colonists, and later, the United States government. 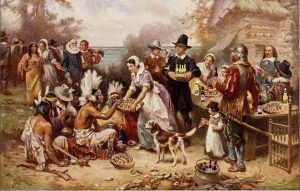 Thanksgiving, a traditional holiday in the United States, would not have been possible without the Algonquian tribes that befriended early English and Dutch settlers in the New World. In fact, many early 17th century European settlers died, in the first few years of colonization, due to starvation and disease. 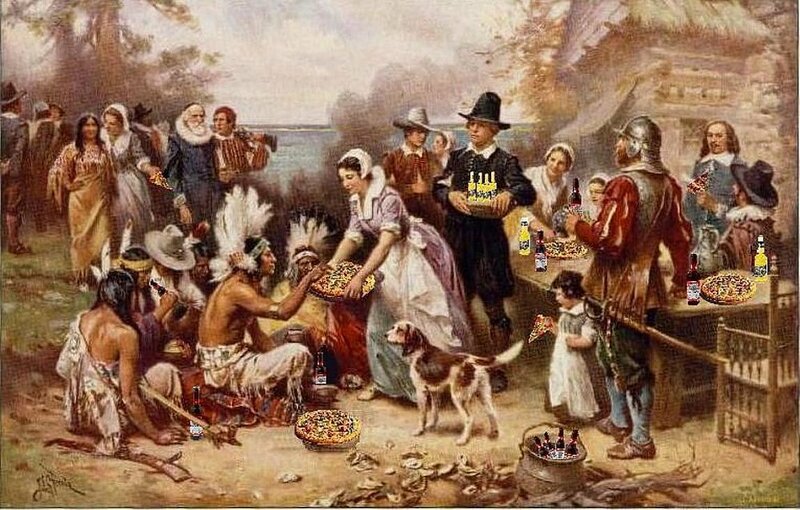 Turkey, pumpkin and Indian corn are three traditional foods of Thanksgiving were actually introduced to the Pilgrims by the Algonquians. Initially, some of these foods were foreign to the struggling European colonists. However, over the course of several years, the colonists learned how to survive in their new environment with the help of their Native American neighbors. The first Thanksgiving was a three-day harvest festival, with ninety-one “savages” in attendance, who gifted the Pilgrims with five freshly killed deer, as their contribution to the festivities. The Pilgrims were impressed with the deer, one noting that it would have taken them (the colonists) a week to hunt five deer, yet the “savages” accomplished this in one day (Heath 82). The Pilgrims viewed their Native American neighbors as “savages” due to ethnocentrism and a worldview based on natural law, or a natural hierarchy based on God’s design. This hierarchy is a Eurocentric philosophy placing the white man as superior and other races, such as, Black, Asian and Native American as inferior. In the following years, as the alliance between the colonists at Plymouth and their Native American neighbors grew, social conflicts began to erupt. The death of Captain John Stone was the first misunderstanding between the Pequot, a neighboring tribe, and the Puritans. There was a failure in justice, as the Puritans saw it, as they wanted the Pequot responsible for Jones’ death to face English law, rather than allow the Pequot to administer justice themselves. Also, one must take into account how the Pequot were viewed by the Puritans as “savages”. This affected how the Puritans interpreted the actions of the Pequot and their place in God’s plan. These views were first reinforced through ignorance of medical knowledge. The pandemic of 1617-1619 killed many Puritans as well as Native Americans, and served to reinforce a worldview based on religious mysticism rather than objective knowledge. Neither the Puritans nor the Native Americans understood how disease was transmitted. This lack of knowledge made it difficult to comprehend their susceptibility, due to a compromised immune system, to foreign microorganisms. The Puritans being affected by the New World microorganisms and the Indians succumbing to European microorganisms brought by the colonists fostered distrust, accusation, and death (Cave 15). The Puritan worldview consisted of two parties: God’s party being white; Satan’s party being dark, heathen and doomed. The New World was a spiritual battleground, and it is amazing that peace lasted as long as it did, with war being the primary vehicle of God’s deliverance and justice, in the Puritan mind. In short, the Pequot War was a war of misunderstandings and natural law, in which the Puritans were righteous and justified, while the Pequot were heathens, soldiers of Satan, and inhuman (Cave 18). The Pequot War lasted almost a year, from 1636 to 1637, with both parties being experienced warriors. In the end, the Pequot were defeated and this relatively short, small-scale conflict served to justify the killing of Native Americans by creating an image of untrustworthy savages that were plotting to destroy those doing God’s work in the New World. This became the bedrock of American frontier mythology (Cave 168). The Pequot were not the last Native American tribe in New England to suffer what the Puritans believed to be divine mandated justice. The Narragansetts and the Wampanoags, once friends of the English in the early 17th century, both discovered, before the end of that century, that the Puritan conception of God’s providential plan for New England left no room to assert Native American autonomy. Such assertions were an offense to the Puritan sense of mission. As the population ratio between the English and the Native Americans in New England shifted in favor of the English, the Puritans authorities became increasingly overbearing in their dealings with their Native American counterparts. Puritan Indian policy, from its inception, was driven by the conviction that if Puritans remained faithful to their covenant with God, they were destined to replace the Indians as masters of New England. By the end of the 17th century, economic changes, such as the declining importance of the fur trade and the expansion of English agriculture and industry, effectively reduced the need for Indian commerce, further jeopardizing the status of Native American communities in New England (Cave 174). The intolerance of Indian cultures reflected essential elements of the Puritan worldview as a struggle between heathen savagery and Christian civilization. Puritan ideology was founded on three premises, which later translated into vital elements of the mythology of the American West. The first was the image of the Native American as primitive, dark and of evil intent. The second was the portrayal of the Indian fighter as an agent of God and of progress, redeeming the land through righteous violence. And finally, the justification of the expropriation of Indian resources and the extinction of Indian sovereignty as security measures necessitated by their presumed savagery (Cave 176). By the 19th century, this mythology began to reflect itself within Unites States governmental policy, during the presidency of Andrew Jackson. The United States went through a major reorientation in race relations during this time. The growing abolition movement led the way to the sectionalism of the Civil War and the consequent emancipation of the slaves. This dramatic transformation in racial policy did not include the Native American tribes of the Southeastern United States (Cherokees, Creeks, Choctaws, Chickasaws and Seminoles), who were considered “the most civilized tribes in America” because of their adoption of the agricultural system of their white neighbors, including the institution of black chattel slavery (McLoughlin xii). By 1838, the Cherokees were forcibly expelled from their ancestral homeland and relocated to the Oklahoma territory, by way of what is now known as the Trail of Tears. The Cherokee tried to prevent this and maintain their sovereign “nation” by adopting a constitution, based on that of the United States, to govern their own land under laws and elected officials. At the same time, the sovereign state of Georgia was attempting to abolish the Cherokee Nation and incorporate the Cherokee under their own laws. Andrew Jackson became president in 1828 and one of his first priorities was to resolve this issue. Jackson, being a slave owner and a renowned Indian fighter of the Western frontier, sided with Georgia, supporting states’ rights to supersede treaty rights. The issue was brought before the Supreme Court twice, once in 1831 in Cherokee Nation vs. Georgia and again in 1832 in Worchester vs. Georgia. Chief Justice John Marshall described the Cherokees as “a domestic, dependent nation” and he proclaimed the unconstitutionality of Georgia’s laws, asserting that federal authority overruled states’ rights regarding Indian treaties. 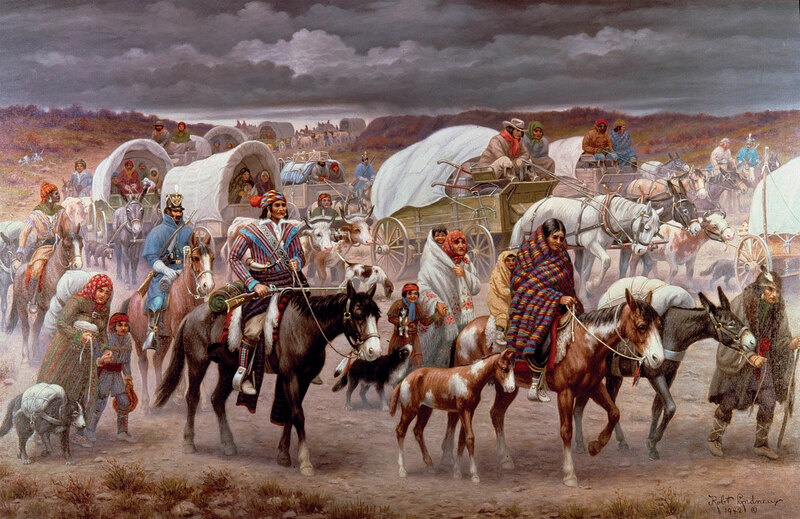 However, Jackson had already persuaded Congress to pass the Indian Removal Act in 1830 that made it virtually impossible for any eastern tribe to escape ceding its land and moving to “Indian territory”, west of the Mississippi River (McLoughlin 2). It is worth noting that, in modern times, these acts would be violations of U.N. Charter, Article 1.2 which asserts, “To develop friendly relations among nations based on respect for the principle of equal rights and self-determination of peoples, and to take other appropriate measures to strengthen universal peace”. Thus, in 1838, the Cherokee were forced from their land and “escorted” west. The trip was estimated to take eighty days, but some of the contingents took almost twice as long due to inclement winter weather, unrelenting sickness because of exposure, and dangerous ice flows while crossing the Mississippi River. Before the Cherokee left on this epic trek, almost 1,500 had died from epidemics in the camps they were housed in; another 1600 died on the journey. As a result of their weakened condition, along with the absence of housing and food, many more died soon after reaching their destination. The United States government had guaranteed supplies for the Cherokee’s new home, for a year after their arrival, but rations were hired out to private contractors who made extra profits by providing less than they had agreed to supply. Oftentimes, what they did provide was rotten meat and moldy corn and flour (McLoughlin 7). In current times, the Dakota Access Pipeline represents another affront to Native American sovereignty and further marginalization of Native American peoples; in this instance, the Sioux tribe located in Standing Rock, North Dakota. There are two primary issues the Sioux have against the pipeline: The pipeline will contaminate drinking water and damage sacred burial sites. Originally, the pipeline was designed to go through Bismarck, North Dakota but was rejected by the citizens there because they didn’t want to risk contaminating their drinking water. The ensuing Standing Rock protests that took place, after the pipeline was redirected through Sioux land, arguing they deserve the same rights and considerations as the citizens of Bismarck. Throughout American history, the treatment of indigenous Native Americans has violated numerous articles of the United Nations Universal Declaration of Human Rights. These violations resulted in the loss of numerous Native American homelands, the Cherokee being only one example, and the genocide of numerous other smaller tribes since the beginning of European colonization. This is largely due to Eurocentric ideals, like the natural law of the Puritan worldview, which elevates the status of European peoples over that of indigenous, Native American peoples through a biased worldview. This mindset is so pervasive and powerful that it still prevails today, evidenced by modern films and television that paint Native American tribes as savage, ignorant and of ill intent toward the “white man”, and the policies of the current United States government. These governmental policies have resulted in the alienation and marginalization of Native American peoples throughout American history. These violations include the removal of Native Americans from their traditional homeland to reservations, oftentimes very far away from their ancestral lands, and in many cases, the genocide of Native American tribes altogether. The violations were masked in the form of “treaties” between indigenous tribes and the U.S. government, though these treaties were often a choice between the survival of a tribe or their complete and utter destruction. In short, the Native American tribes were never in a position, or held enough power, to ever guarantee a fair deal with the U.S. government in these negotiations. The result of this imbalance of power and lack of respect manifested itself in the form of genocide and the loss of human rights, and their homelands, for many indigenous peoples of North America. Cave, A. A. (1996). The Pequot War. The University of Massachusetts Press. Heath, D. B. (1963). A Journal of the Pilgrims at Plymouth. Corinth Books, Inc.
McLoughlin, W. G. (1993). After the Trail of Tears. The University of North Carolina Press. This entry was posted in History, Native Americans. Bookmark the permalink.